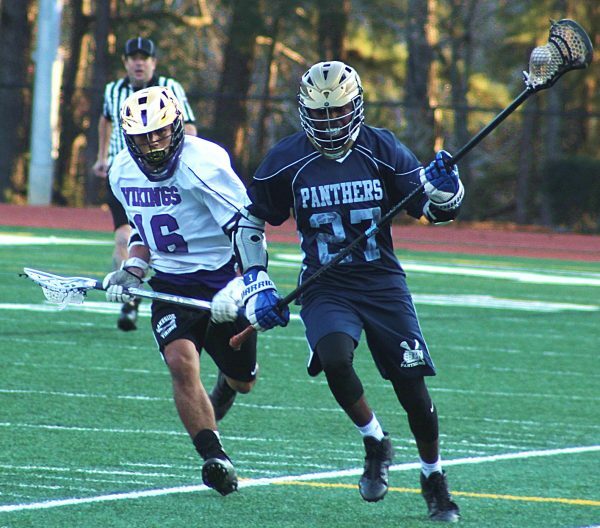 Adam Prusik scored four goals and had one assist to lead the Lakeside Vikings to an 11-0 win over the Southwest DeKalb Panthers in high school lacrosse action at Adams Stadium on Thursday. The Vikings, now 3-3, scored five first period goals, including two in the final 1:25 by Prusik for the 5-0 advantage heading into the second period of action. Prusik had gotten the assist on the third goal of the game for Lakeside as he passed to Clinton Boyd on the right side where he threaded the needle between two defenders and the goalie for a goal into the bottom left side of the goal with 4:34 to play. Prusik got inside 10 yards on the right side of the net with 1:25 to play in the period for his first goal. He followed it up by coming out from the behind the net and fired another shot into the net to make it 5-0. Boyd got the only score of the second period following a Vikings timeout. He got the ball and flashed across the middle of the field and fired it into the net from 12 yards out to make it 6-0 at the half. 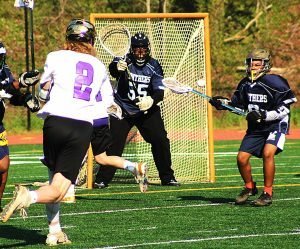 Lakeside scored three goals in the third period as Ketan Morrison took a pass from Eli Rosenberg to make it a 7-0 game with 9:20 left in the period. Alex Bachman drilled a low bounce shot from 15 yards out with 4:30 remaining and a minute later Prusik was at it again firing a long shot from out front into the corner of the net for a 9-0 advantage. Less than a minute into the final period of play Rosenberg got his second score of the game coming out from behind the goal to fire a shot into the goal for a 10-0 Vikings’ lead. The Vikings had a one-man advantage with just 1:45 to play due to a penalty on the Panthers and Prusik picked up his fourth goal of the night for the final of 11-0. Rosenberg had opened the scoring in the first period with an assist from Morrison and Boyd got the first of his three goals at the 5:59 mark of the first for the early 2-0 lead. Vikings’ goalie Ben Maughon pitched a shutout in the win with several nice saves and good defense out front from his teammates. The Panthers fell to 0-3 on the season with the loss.